How do we make sense of leadership when the world's leading democracy, the United States, elects Presidents with leadership styles as contrasting as Barack Obama and Donald Trump? How we do reconcile a world of ever-proliferating “leaderless” movements like #MeToo and Black Lives Matter, but also ever-proliferating strongmen like Russia’s Putin, Turkey’s Erdoǧan, and Egypt’s el-Sisi? And where do the rest of us fit in? A world of hyper-empowered crowds and rising expectations around participation is scrambling leadership styles and strategies across the sectors. Most of us understand how old-power leadership works. After all, it's been the main way to get ahead, whether you are a head of state or a division manager at a medium—sized business. But in an age where we are so hyperconnected, and where so many now expect to participate in our world in more rewarding ways, we also need to reckon with new power: the ability to harness the energy of the connected crowd. Consider first how you think about the world. Do you have an “old power” mindset, putting your trust in expertise, believing in the virtues of hierarchy and control, preferring confidentiality over radical transparency? Do you see competition as a way to get the best out of people? Or are you thinking in a more “new power” way – with collaboration, the wisdom of the crowd and openness more top of mind? Second, think about the methods you use. Do you rely on downloading your ideas on to the world? Does your leadership rely on what you know, own or control that others do not? Or are you able to engage the crowd and get the best from them? Can you start movements and sustain communities that live outside your own organization? The Crowd Leader combines a new power leadership model with a commitment to, and articulation of, a new power mindset. The Crowd Leader wants to do more than channel the power of her crowd; she wants to make her crowd more powerful. Here we find the protagonists in decentralized movements like #MeToo or #BlackLivesMatter. But in New Power, we also find that Pope Francis is an effective Crowd Leader, pushing power down and out in his Church, and sending early signals designed to empower his laity, reduce the power of his Cardinals and shifting norms on issues such as sexual morality without necessarily relying on doctrine or his formal authority. The Cheerleader champions new power values like collaboration, transparency, and participation, but still leads in an old power way. He either isn’t willing to relinquish control, or hasn't yet mastered the ability to channel energy of the connected crowd. Think here of President Obama – as a candidate, Obama ran as a crowd-leader, creating a huge surge of new power in small donations and volunteer energy to out-run Hillary Clinton in the primaries. As president, he governed traditionally and didn’t bring his movement into office with him, which hindered his ability to elect his successor or position his party for this post-Obama era. The Castle Leader pairs old power values with an old power leadership model—this is the traditional hierarchical and authority-based model of leadership most of us grew up with, and which is widespread in sectors like the military, business, and education. 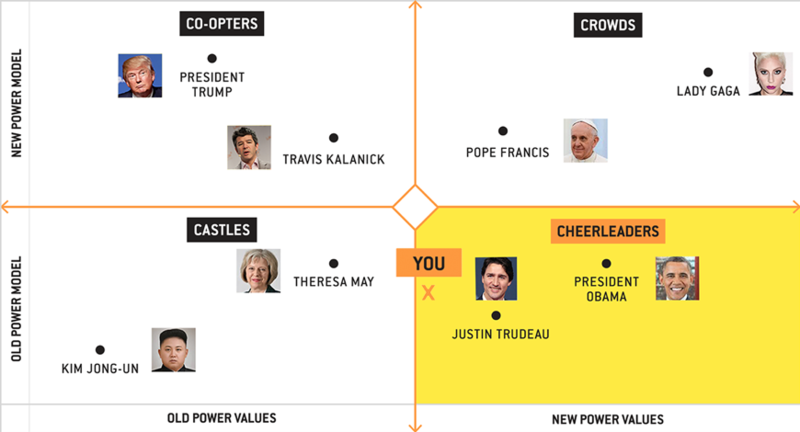 There’s a big range of leaders here, from a strict authoritarian like Kim Jong Un to a mainstream political leader like Theresa May or Pope Francis’s predecessor, Benedict. There are many situations where the castle leader is still very useful. The Co-opter deploys a crowd and skillfully uses new power tools and tactics—but does so with an old power mindset, and in some cases to concentrate power for himself. Think here of President Trump, who at once is able to channel a vast decentralized social media army of supporters, but whose essential proposition is “I Alone Can Fix It” and a return to traditional hierarchies, positioning himself as a kind of “platform-strongman” leader at the top. Many crowd-based technology leaders, not least Mark Zuckerberg, face a crossroads today of whether they lead as Co-opters or Crowd Leaders. There are two big questions for us all. One, what kind of leader are you today? Second, what kind of leader should you become? This quiz is designed to help you start to answer these questions, and shows where your leadership style fits among some of today’s best known leaders. You can take the quiz here, and and learn more about New Power here.